« Happy Birthday Marian McPartland! In writing the latest blurb for my “Diversions” section (see sidebar lower right of page) about the latest exhibit at the Peabody Essex Museum, I was so moved by the memory of a film about the Maori facial tattoos known as Moko. I saw ‘Moko’, a short (10-minute) film (producer Trevor Haysom; writer/director Jillian White), at Sundance in January 2001. 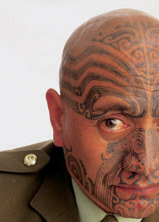 Nga Puhi chief Kingi Taurua was one of the first to get the excruciatingly painful tattoo done on his face. Moko identify royalty, lineage, and more. During the colonization of New Zealand, Maori were encouraged to stop getting the moko and assimilate. New Zealands Maori traditions are a powerful reminder of defiance in the face of cultural genocide. The Peabody Essex Museum’s exhibit is an opportunity to get a glance of this unique and dramatic tradiion.